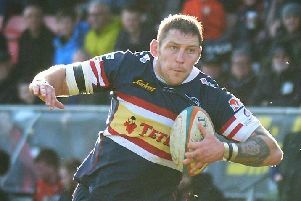 Doncaster Knights posted their first win in five games when booking their place in the B & I Cup semi-finals. They did so in style with an impressive five-try 38-17 win over Munster A at Castle Park. “I’m delighted with the result and to be honest we could have put another 20 points on the scoreboard,” said director of rugby Clive Griffiths. “But a win of any description would have done us today. Despite Knights having done their homework, the Welshman admitted Munster still managed to surprise them. After being second-best in the forward exchanges in the league defeat against Jersey last time out, Griffiths was delighted with the forwards’ dominance on Saturday. “We also showed we can be dangerous with Bruno Bravo operating on the edges and our kicking game was a little better.” he said. “But there is still room for improvement. Although we created some lovely stuff we’ve got to look at our wider attacking play. Scrum-half Bravo and flanker Latu Makaafi could both be struggling to be fit for Saturday’s daunting Championship trip to Worcester.